Rainy Autumn Morning Watercolor – Let's Paint Nature! Raindrops pummeling onto the concrete outside my window awakens me from a deep sleep. My eyes open, but I do not want to move. This time is to be treasured. I will not let that voice which asks, “What time is it?”, steal this moment. I will not let my cell phone sitting on the nightstand, rob the rain its due. I will not let my wandering mind kidnap my attention. As if an audience is clapping their hands in great excitement, a clamor of drops fight to be individually heard. I hear you… some high, some low. Some clank on my window. Some trickle down the gutter. Can raindrop sound compete with raindrop brilliance? The few remaining leave on the tree outside my window has illuminated in its soaked state. An autumnal glow against a dark sky holds my gaze. Leaves quickly fall like bricks, carried by a steady stream. The drencher causes commotion in the air which wafts a lovely aquatic aroma to my nose. I breath it in. O, how blessed is this time to be treasured! This time is to be treasured. A key point we need to keep in mind. Thank you. Thanks, Micheal…. I am honored! That looked a lot like us today. I felt the same way when I awoke, too. Let the love you receive dwell in your heart, then share it with others. You’re welcome Pat. And I love your good words! It’s my pleasure to share. 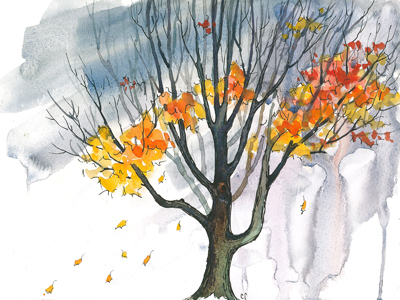 Beautiful tree – and I love the little leaves falling and blowing in the wind! Very poetic. Thanks Alanna! I don’t always remember to include movement in a sketch, but it does convey the feeling well! Like our sketches of people with legs that tapper on the bottom…looks like they’re walking.